1 – “Nix” to Sanctions? In her most bizarre response to questions from members of the Subcommittee, Jacobs belittled the importance of stealing and kidnapping children by comparing it unfavorably on a scale of importance and impact to trafficking and other illegal cross-border activities, and said directly that the Department of State will not comply with the will of Congress that it entertain the threat of sanctions, should Congress successfully act to make them possible by enacting reintroduced children’s and parents human rights legislation, The Sean and David Goldman Child Abduction Prevention and Return Act, this year. Jacobs, apparently seeking to preempt efforts to support such enabling legislation, said that this was because U.S. military and business ties in Japan are more precious, more vulnerable, more delicate, and more precarious than the lives of 4 and 6, 8 and 10 year-olds who have been kidnapped, hidden, and kept out of contact with their parent and families. According to Jacobs, these all-important business and military relationships with Japan would be damaged and falter if children were to be firmly protected from kidnapping. I’m left to wonder what could possibly constitute a more malignant child-state policy? The United States, possessor of the world’s largest and most overtly activist criminal justice and military apparatuses is not behaving this way out of weakness, as officials imply when bowing to the sovereignty and inadmissible jurisdictional claims of Japan and other abduction-friendly states. The Department of State, which knows a thing or two about historically threatening and/or sanctioning countries large and small from Russian to Greece to Iran to Syria to Afghanistan to Pakistan to Yugoslavia to Vietnam to Laos to Cambodia to Cuba to Chile to El Salvador to Nicaragua to Panama to Honduras to Grenada to North Korea, suddenly becomes shy about appearing to be too assertive when it comes to protecting children from devastating harm. This is how it appears, until one begins to study the actual policies pursued by the United States with regard to the delicate areas of jurisdiction, sovereign rights, and enforcement of international law and treaty obligations. The U.S. commitment in these areas has long been dubious at best, self-serving for the rest. See note (1) below. Because we intend for it to be known that we are real advocates for our children, we ought, in my opinion, to be asking for Ambassador Jacobs’ job. It simply is not acceptable for such a callous and openly indifferent posture to be taken from the key representative diplomatic post in the US government regarding the protection of children from international kidnapping. To many of us, Susan Jacobs’ unique qualification for her job seems often to be her sloppy imprecision, her ability to undermine any interlocutor’s confidence that she would ever have a substantive answer to a question so that henceforth they will give up on asking anything further from her. As one fellow parent recently wrote, this is the DOS/OCI “way of sapping the strength and spirit of LBP’s by forcing them to deal with … indifference, incompetence and hostility… In this way they can “resolve” abduction cases without ruffling any diplomatic feathers by grinding the LBP’s into the ground.” I cannot help but agree. Stupidity is a blameless vice, unless it is a pose of power. – See note (2) –In this case, it masks non-cooperation with Congress and much darker motives that aim at disciplining dissent with indifference to the perpetuation of trauma to mere children. David Goldman reminded us all at the close of the hearing that Jacobs was appointed to her newly-created position in the Department of State only hours before legislation was introduced into the U.S. Congress to create a far more powerful and independent “Ambassador-at-large” to organize and discipline the prevention of abduction and the return of internationally abducted children. The creation of the position and her subsequent appointment appeared therefore to constitute an attempt by the Department of State to wrest control of the issue from political accountability among members of Congress in order to prevent effective action against international abduction from arising to inconvenience the Department of State in the pursuit of its usual business and military goals. That the move was a success is evidenced by the fact that the rate of international parental child abduction has continued to rise unabated into the thousands every year. This is how the Department of State defines success. 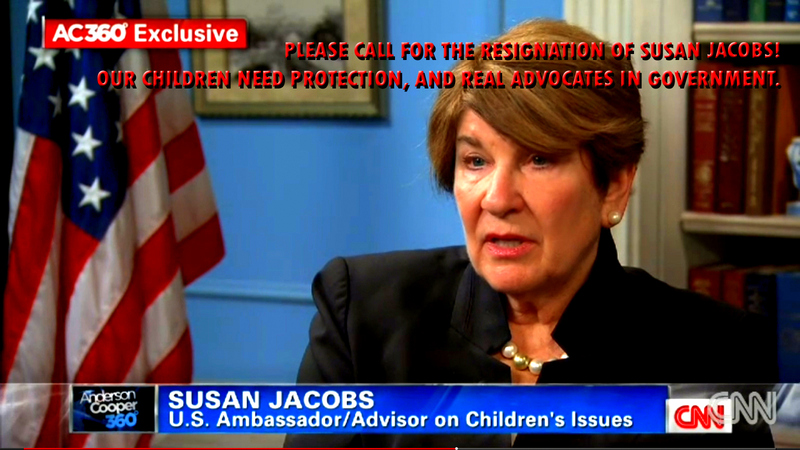 Susan Jacobs should resign her post. And the Department of State’s Office of Children’s Issues, – which by servicing corruption and crimes against children in Japan, India and elsewhere is an enormous threat to U.S. children – should either be eliminated or relieved of its position as the agency designated with primary authority within the U.S. government over international parental abduction. The office could be relegated to the role of the adoption services management agency with which it currently masks its cynical operations against children, and the matter of international kidnapping should be restored to those who are willing to recognize the need to protect children with a sense of strength and purpose. Economic and political sanctions, and at minimum the engagement of the most active, assertive, risk-taking criminal justice agencies of the U.S. government at least have the virtue of collectively providing potential means to achieve the aim of protection and return of the children we love from intolerable circumstances. (1) See Human Rights in the United States: Beyond Exceptionalism, Hertal and Libal, editors; Cambridge University Press, 2011. (3) Patricia Apy testified at the hearing that the Department of State has repeatedly opposed a provision of the offered child abduction legislation under which members of Congress would be informed that there is a pending international child abduction case in their district. Now, why would the Department of State be opposed to informing members of Congress who might like to know how people in their area are being treated by and in a particular country with which the U.S. or the Congressperson might have dealings? The State Department wants the information suppressed. It does not want people to know about this enormous human rights abuse, the kidnapping of our children from the U.S. to Japan, etc. If there were a groundswell against the thousands of international child abductions that happen every year, it would be “detrimental to the relationship” that DOS wants to maintain with members of those responsible governments. This is precisely what Susan Jacobs and the Office of Children’s Issues represent; the suppression of information about International Parental Child Abduction. So blue, I can’t begin to say. Heartbreaking & infuriating — &amp well written. Indeed! Jacobs speaks solely for the Department of State! Knowing that the Department of State is on the wrong side is a key step in overcoming resistance to trying to find a means to work and promote a counter-message, in a different form. How is it the case that the person who is supposedly the greatest government advocate for America’s abducted children is, somehow, simultaneously Public Enemy #1 for these same children? To say that the inmates are running the asylum would be an imprecise, and cliche, analogy, but I’m at a loss for a more one more apropos.. Truth is stranger, and uglier, than fiction and, in the eyes of State, children are our least precious commodity.